What does it really mean to be a patriot? Does it mean you unconditionally love your country, willing to do anything and everything for it? Does it mean you love your fellow countrymen unconditionally, never questioning their actions? Or does it mean you hold your country to the highest standard, even in tough times, in hopes that it will come out stronger and better for the future? 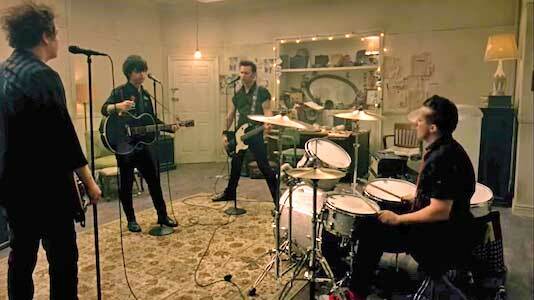 In Green Day’s 2009 rock ballad “21 Guns”, they explore the themes of patriotism in a way that only they can, with enticing lyrics and a soaring chorus. 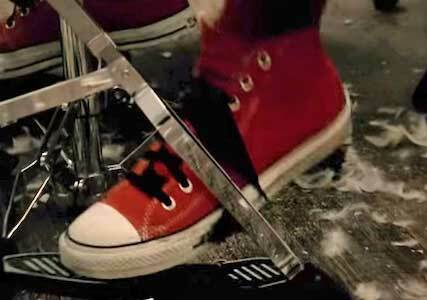 Drummer Tre Cool wearing a pair of red high top chucks with black shoelaces. The music is hits hard, with strong guitar and drum playing elevating the lyrics with a hard hitting sound. The song’s chorus is very powerful, with its stadium anthem vibe giving the lyrics a powerful feel. The lyrics of this song are genius because they continuously ask you questions. These questions are designed to make you think about your own sense of patriotism, and Armstrong does a great job of achieving that goal. This song is one of Green Day’s very best because of its beautiful and perfect merger of lyrics and music to form one consistent and powerful feeling throughout the song. The female protagonist, Gloria, walks through the gunfire to get to her lover in pair of chucks. The music video features a female named Gloria, and her partner, Christian, holed up in a motel after robbing a bank. The police find them, and open fire through the window. As bullets rain down on the room, the band continues playing in the middle of it all. As the bullets tear apart the room, Christian and Gloria become calm and walk toward each other, embracing in the middle as the lights go out. When the lights come back on, the couple is unharmed, although the room around them is absolutely destroyed. The band playing through the bullet spray. Get yourself a pair of patriotic chucks by clicking on the links below.